Little Flower takes a therapeutic approach to the culinary arts and strives to provide those in our care the opportunity to develop the skills necessary to make it on their own. For these young adults, the culinary arts is much more than fun; it is a skill that will empower them as they transition out of Little Flower to independent living. The program teaches valuable life-skills, fosters self-esteem and confidence as well as introduces basic food and nutrition skills and helps prepare them for life on their own. Educate youth care about good nutrition and healthy eating habits. Empower by teaching practical kitchen skills and techniques. Provide the opportunity and framework for those interested to experience and potentially enter a career in the food industry. The Culinary Arts Program, a favorite among youth residing on our Wading River Campus, consists of a “Beginner’s Level” class taught by a culinary arts professional, which teaches the value of healthy eating habits, good nutrition, essential kitchen and cooking techniques. During each class, students literally roll up their sleeves and cook a nutritious meal, while gaining tremendous confidence and learning to create healthy, delicious meals and make smart food choices. The curriculum teaches kids nutrition, healthy eating habits and gives them the knowledge and confidence to prepare their own food at home as well as teaches kitchen health and safety, proper food storage and handling, cooking techniques and knife skills. The program seeks to encompass a healthy take on recipes, incorporating the on-campus garden project, locally sourced produce and farm-to-table concepts. As the kids begin to understand where their food comes from they learn how food choices affect them and the greater community. 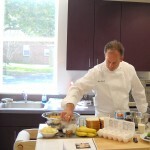 We also incorporate outside learning activities, such as trips to local restaurants at the culmination of the program to watch how meals are prepared in a professional kitchen, a demonstration and class at the Culinary Arts and Hospitality Center of Suffolk County Community College as well as guest speakers, such as local chef John Doherty, to talk about and bring to life concepts like farm-to-table, local food sourcing, and serve as role models to our youth interested in pursuing careers in the food industry. We want our kids to feel accomplished in the kitchen, and feel like they can take their skills and knowledge into the world and make healthy choices for themselves and their communities.